Picture Book Monday - A review of Miss Annie: Freedom! Young children and animals often believe that they are ready to do many, if not all, of the things that the "big kids" or grownups do. Children try to cook something and set food on fire They take clocks and other machines apart thinking that they will be able to put them back together. Kittens climb trees that they cannot figure out how to come down, and puppies pick fights with animals much bigger and tougher than they are. In today's graphic novel title you will meet a kitten who is determined to go out into the big world because she is convinced that she knows how to manage out there as well as she manages in her house. Miss Annie is a five month old kitten and she is convinced that she is old enough to do just about anything, and yet her people will not let her go outside. While her master walks in the park looking for inspiration, and her mistress works in an office, and her young mistress goes to school, Annie walks around the house looking for something to do. She plays with a pen, shreds a leaf from a flower arrangement, and finds a mouse. A live mouse. 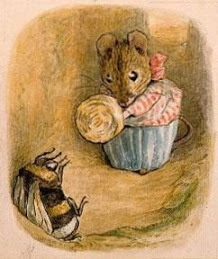 For some reason, though the mouse knows that mice are eaten by cats, and though Miss Annie knows that cats are supposed to eat mice, the mouse and Miss Annie become friends. When everyone is asleep that night Miss Annie gives the mouse a name and she tells the mouse all about her ambitions to go outside. Keisha the mouse cannot understand why Miss Annie would want to do such a thing. After all, “Outside is BIG and DANGEROUS.” Miss Annie is positive that she will be fine outside, but when she actually goes outside, she learns that she still has a lot to learn. All too often young creatures, including cats and humans, think they know everything there is to know. If they are lucky someone kind comes along who helps them realize that we never stop having to learn about the world we live in. With wonderful comic illustrations and a sensitive, sweet, and gently funny story, this graphic novel will appeal to readers of all ages. February is Black History Month in the United States, and in honor of this celebration, I have reviewed a poetry title that brings together poetry written by some of America's greatest African American poets. The first book of poetry written by an African American was Poems on Various Subjects, Religious and Moral. The poet was Phillis Wheatley, who as a child was brought to America in a slave ship in 1761, and who became the property of a Boston gentleman. Phillis was lucky to end up in this household because her owners were kind and they encouraged Phillis to educate herself. Phillis made excellent progress with her studies and she began writing poetry in English when she was still very young. After Phillis’s death in 1784, very few African-Americans were given the opportunity to write poetry, and then a slave from North Carolin, George Moses Horton, began to write poetry and two of his collections were published in 1829 and 1845. Like Phillis, he used his poetry to “defend the humanity of African Americans,” and poets who came after him did the same. Then, during what came to be called the Harlem Renaissance, many young African Americans began to write poetry, and the words of Claude McKay, Langston Hughes, Countee Cullen and others delighted both African American and Caucasian readers. After the wounds caused by the Great Depression began to heal, more African American poets began to share their work with the world, using their words to ask for justice for their people, and to also tell their stories. In this extraordinary collection of poetry the editor presents the poems of African American poets in chronological order, which gives readers a real sense of how such poetry evolved and changed with time. Each poem is prefaced with a note from the editor, and the notes give readers biographical information about the poet and commentary on the poet’s subject and style of writing. The poems included in the collection vary greatly. There are those written in rhyming forms such as one written by George Moses Horton, there are a pair of haiku written by Richard Wright, and there are poems written in blank verse. Irrespective of the form used in their creation, these memorable poems all have strong voices that are rich with imagery and history. I have always loved water and spent many summers when I was a child and a teenager at the local pool or at the seaside. Jade Baxter does not like to swim. In fact, she does not like getting wet, and since she is a largish girl, she hates putting on a bathing suit. You can only imagine how she feels when she finds out, by accident, that she is part mermaid and that her legs turn into a tail when she is immersed in water and inhales some. While some people might like being half mermaid, Jade does not. It makes her life very complicated indeed. Imagine what it would be like to go to the pool and sprout a tail when you accidentally breath in some water? Today I am participating in a blog tour that is featuring the latest book about Jade and her mermaid adventures. The first book, Real Mermaids Don't Wear Toe Rings, is funny and highly entertaining. Jade's story is continued in Real Mermaids Don't hold their Breath, and it too is a great read that combines fantasy with a coming-of-age tale. The latest book in the series, Real Mermaids Don't Need High Heels, carries on Jade's story. In it she has more problems to solve and she learns a little more about her mermaid heritage. Jade is thrilled. She is finally in high school where she will have more freedom and more choices. Jade will have a locker rather than a cubby, and she is hopeful that she will be able to have a normal life again. Many people might find a normal life boring but Jade craves an ordinary and predictable life. Jade is all ready to enjoy her first day of school when her grandmother arrives bringing Serena with her. The last time Jade saw Serena the girl was a mermaid. Apparently Serena’s father wants his daughter to live her life as a human most of the time. If Gran and her family help Serena life a life on land, Serena’s father will behave himself. If they don’t, he will start vandalizing and stealing boats, and who knows what else he will do. At the best of times he is temperamental. So now Jade has to babysit a mer teen who does now know how to speak English, who cannot write, and who cannot bear to wear shoes. The good news is that Serena is a sweet and loveable girl and most people quickly become fond of her. The bad news is that the mer girl is prone to doing things that create problems for Jade. Watching over Serena seems like a huge issue until Jade goes to Bridget’s Diner with her friend Cori and their boyfriends Trey and Luke. There she finds out they have a much bigger problem to worry about. The Mermish Council members, especially the leader, are facing a possible revolution. The mers are getting sick and tired of the Council’s often cruel actions. To put a stop to a potential uprising, the Council is imprisoning troublesome mers in the lake, and they are going to enforce Tidal Law. At the next full moon, just nine days away, they are going summon all the mers, including the Webbed Ones, to the mer village in the ocean. Since Jade was born a human and only recently acquired the ability to transform, she will not feel the pull of Tide Law, but her mother, boyfriend, Serena, Bridget, and the school swimming coach who were mers from birth will all be unable to avoid the summons. Jade cannot believe that once again she has to deal with a problem involving mermaids. In this third Real Mermaids title the author takes poor confused Jade on another adventure and this time Jade has to use her head and her heart to save the ones she loves. New information about the characters is revealed as the story unfolds, and readers will be delighted with the thoroughly satisfying ending. Today's title is a perfect example of a picture book where the text and the art is perfectly married to give readers a memorable experience. I think this book has a beautiful and meaningful story about friendship and art that is truly magical. Luna is a little girl who lives in a distant cold land where there is a great deal of ice and snow. Luna loves to “dance through the snowflakes” in her wintery world, but more than anything else Luna loves to spend time with Bear, who is big and white. Bear is her best friend and they do everything together. Luna waits and waits for Bear to come home, but many days go by and there is no sign of her dear friend. True friendship is a precious thing, and this picture book celebrates friendships with a delightful story and beautiful illustrations. Children will enjoy seeing where Bear goes as he tries to find another sunshine flower, and they will be delighted when they see how the story ends. When I try to remember which poem first showed me the joys of reading poetry, I think of The Owl and the Pussycat, which was written by Edward Lear. It is a story poem, and it is also a delightfully peculiar and sometimes funny poem. When it comes to children, funny poems are wonderful ambassadors for poetry. Amusing and nonsense poems tickle children's funny bones and they show children that poetry can be a lot of fun. Today's poetry title is packed with poems that will make children smile and laugh. In this splendid poetry collection Calef Brown gives us poems that are deliciously odd and funny. He begins with a poem called Alphabet Sherbet in which he asks us “Have you ever heard of it?” He then goes on to tells us about the “beautifully blue” B’s and the “fair” F’s that one finds in this cold, sweet, word-filled dessert. Then there are the poems that describe things such as worms, orchids, and an Allicatter Gatorpillar. An Allicatter Gatorpiller is a truly remarkable creatures. It can change its appearance and become an Allibutter Gatorfly! Having your first real crush can be a wonderful, and sometimes painful, emotional roller coaster journey. Since Valentine's Day is only a few days away, it is fitting to share this story with you. In the story you will meet a large bunny boy who has a big crush on one of his classmates. More than anything he wants to tell his crush how he feels about her, but how is he supposed to do this? Will a Valentine's Day card solve his problem? Love and affection makes our lives richer and happier, and armed with these emotions we are stronger when times are hard. In today's poetry title Calef Brown gives us a delightful selection of poems that are about the joys of being close to someone. Usually on Picture Book Monday I review fiction picture books, but A Splash of Red, a nonfiction picture book, is so special that I decided to make it today's review title. The story tells the story of Horace Pippin, a self-taught artist who overcame many challenges to become a much admired member of the artistic community in the United States. On February 22, 1888, Horace Pippin came into the world. The grandson of a slave, Horace did his part to help out by doing chores and taking care of his siblings. At the end of the day, once all the work was done, Horace used to draw pictures, capturing on paper the things that he had experienced and seen during the day. He also drew pictures at school, delighting his classmates and infuriating his teacher. Then Horace was shot in the shoulder. His right hand could not move normally, nor could he use it to lift things. For the first time since he was a little boy, Horace could not paint or draw. It was as if a door to a special world had been closed in his face. In this remarkable picture book biography, Jen Bryant’s emotive text is paired with Melissa Sweet’s splendid mixed media artwork. On several of the pages the artist incorporates hand lettered quotes into the artwork, giving us a very personal connection with the thoughts and feelings of one of America’s great artists. Notes at the back of the book written by the author and illustrator give us some insight into the journey that they took, together, to find out about Horace Pippin, his work, and his legacy. When today's poetry title arrived at my house I was thrilled. It was the perfect book to review in February because February is a month when many people think about and give thanks for the people they love. This book celebrates the people who make our days better, and the things that make our life sweeter. It would be a perfect book to give to that special someone.